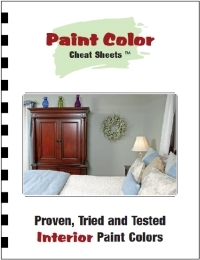 Searching for bathroom paint color ideas? As in most rooms, the choice will largely depend on personal preference, but some color schemes work better than others. Think of the bathroom as an oasis- clean, calming, and comfortable. Choosing bathroom paint colors in blues, greens, and aquas will contribute to a soothing, spa-like feel. Because these tints are reminiscent of water, they are a natural choice in the bathroom. Shell accents and sand- or oatmeal-colored rugs and accessories will take the ocean theme even further. Or, go more modern by choosing pewter fixtures and incorporating rich, chocolate brown accents. In either case, lighter, brighter versions of these colors tend to produce the most pleasing results. Too-subdued shades, paired with neutral accessories, will make the room appear bland. Pink might be the first thing that pops into your head if you want a feminine color scheme, but don’t overlook other alternatives. Coral walls with darker orange trim will definitely get you going in the morning! For a more serene environment, consider lilac. It’s fun and feminine when paired with white, but it can also be combined with blue for a more gender neutral environment. Combining muted greens with complementary neutrals is a great way to create a relaxing, masculine bathroom retreat. The most pleasing colors for this color scheme will have a brown undertone. Look for names like moss, olive, or sage. Mottled stone countertops and dried naturals create a forest-y feel that can be very appealing. White is a nice neutral choice that never goes out of date. Keep boredom at bay by using black, navy, or bright red trim and accessories. The high contrast adds visual interest and makes the whole room look clean and modern. 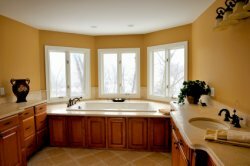 Lemon yellow is an energizing choice for children’s bathrooms. It’s especially attractive in rooms with a lot of natural sunlight. Choose white fixtures and white or light pine cabinets for a bright, cheerful look. Another popular neutral is beige. Avoid pairing it with very dark colors, or it will look dirty. Selecting muted versions of your favorite colors will create a pleasant environment that will appeal to everyone. Formal powder rooms can handle more dramatic treatments than everyday retreats. Because no one will be spending hours in there, bathroom colors can be darker, brighter, and bolder. Deep red walls accented with contrasting fleur de lis look wonderful with brass or pewter fixtures. And for a very modern feel, combine deep gray walls, black fixtures and tiles, and lots of shiny chrome accessories. Just make sure the room is well-lit, or it will look like a cave!